It’s the most wonderful time of the year. 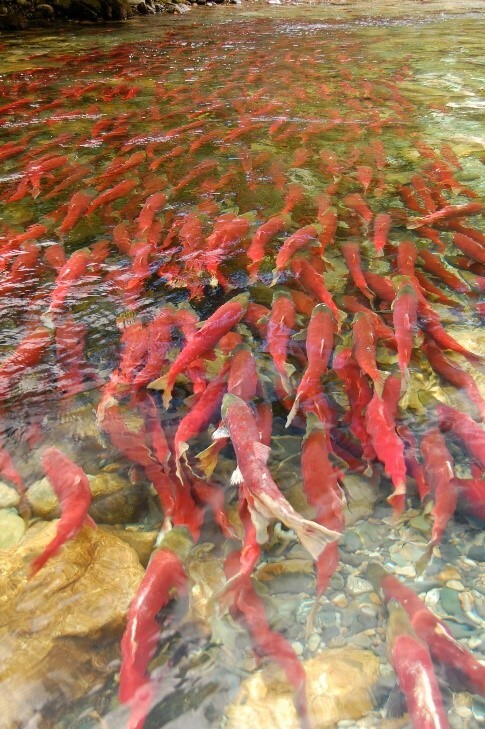 BBQs, ice cream, cabin trips… and the upriver sockeye salmon spawning migration in British Columbia, Canada is in full swing! Each year millions of sockeye salmon return to the Fraser River to migrate to the same stream where they were born in order to spawn. The upriver migration is a biological wonder. Salmon cease feeding in the ocean, so upriver swimming, morphological changes, and spawning behaviours are fueled entirely by energy stores. The fish develop impressive secondary sexual characteristics during the migration, turning bright red and green, and males develop a pronounced dorsal hump and kype (hooked jaw). Some populations travel over 1,000 km in just a few weeks – traversing rapids, and avoiding predators and fisheries gear. Sockeye salmon have a single opportunity to reproduce and naturally die shortly after spawning (semelparity). Consequently, an individual fish that does not make it back to the spawning ground will have zero lifetime reproductive success. Our research team has spent the past couple of weeks on the side of the Fraser River, tagging and collecting sockeye salmon for our experiments. Unfortunately, it is hot. Very hot. As in, we’re wearing bathing suits instead of waders and diving into the river to cool off every chance we get. There is simply not enough beer and ice cream to beat the heat. Conditions have been warm and dry all across the west coast of North America for several months. Fraser River temperatures have been up to 4–5°C warmer than usual (DFO Ewatch), which is alarming salmon biologists and managers. 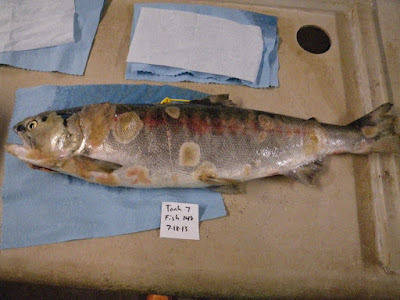 Elevated river temperatures have been repeatedly correlated with high mortality during the spawning migration, and there are grave concerns that the number of fish turning up on the spawning grounds in 2015 could be catastrophically low. A fair amount of research has been conducted on the thermal tolerance and physiological capacity of Fraser River sockeye salmon which can be used to help inform management. First of all, high fidelity to natal streams has resulted in many genetically and geographically distinct sockeye salmon populations across the Fraser River watershed, and reproductively isolated salmon populations are hypothesized to be locally adapted to their environmental conditions (Fraser et al., 2011; Taylor, 1991). Fraser River sockeye salmon populations with more challenging migrations arrive at the mouth of the river with fewer eggs, higher body energy stores, a more streamlined body shape, high swimming performance, greater aerobic scope, higher cardiac scope, and larger hearts with an enhanced oxygen supply (Crossin et al., 2004; Eliason et al., 2011; Eliason et al., 2013b). So populations with difficult migrations appear to be prepared for the challenge ahead, despite never having previously experienced the upriver migration conditions. 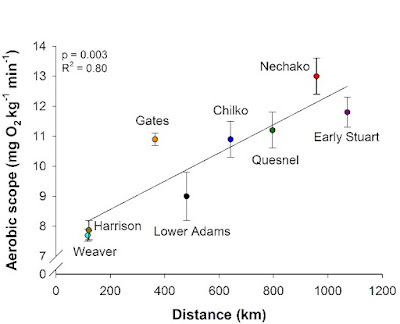 Fig 1: Aerobic scope as a function of upriver migration distance for 8 populations of Fraser River sockeye salmon. Data from Eliason et al., 2011; 2013b. In addition, sockeye salmon populations encounter varying temperatures depending on when they enter the river and where they spawn. Functional thermal tolerance for each population appears to be tailored to the typical environmental temperatures encountered (Eliason et al., 2011). For example, Weaver Creek sockeye salmon typically migrate upstream in the cool fall months, and they have a correspondingly lower functional thermal tolerance compared to populations that migrate in warm summer temperatures. Chilko sockeye salmon have the highest and broadest thermal tolerance of all the Fraser River populations studied to date. They enter the Fraser River in the middle of the summer and encounter peak river temperatures while migrating through the most challenging sections of the river, but spend the final third of their migration traveling up a cool glacial river to finally spawn in or adjacent to a glacial lake at ~1,200 m in elevation. Collectively, these results provide compelling, though not conclusive, evidence that Fraser River sockeye salmon populations are locally adapted to their upriver migratory environment. Fig 2: Aerobic scope as a function of temperature for 6 populations of Fraser River sockeye salmon. Temperature frequency histograms indicate the typical temperatures encountered by each population over 14 years of historical data (1995-2008). Data from Eliason et al., 2011. Functional thermal tolerance has been determined for 7 populations so far (Eliason et al., 2011; 2013b) and management agencies are able to use this information to predict how the different populations may fare in a given year. If river temperatures exceed the functional thermal tolerance for populations currently in the river, fisheries can be shut down to enable more fish to arrive on the spawning grounds. 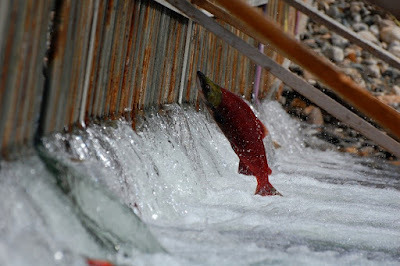 This year, we expect many of the returning salmon to be from the Chilko population. This presents us with an interesting natural experiment – how will the super-high-temperature-tolerant population cope with this exceptionally warm year? How will the other co-migrating populations with lower thermal tolerance fare? Tagging experiments from our research group will link migration rates and migration success with river temperature, disease profiles, and population differences. Fig 3: Number of years (between 1996 and 2008) that en route mortality exceeded 50% for a given population. Note that en route loss exceeded 50% for none of the years for the Chilko population, whereas it was greater than 50% in every year for the Weaver population. Data from Hinch and Martins, 2011. This work is currently being expanded in a few different directions. On the one hand, I’m interested in the physiological mechanisms that determine thermal tolerance. Cardiac function appears to be the primary factor limiting functional thermal tolerance in salmon (Eliason et al., 2013a; Farrell et al., 2009). Specifically, swimming performance and aerobic capacity decline at warm temperatures due to an inability of the heart to deliver sufficient oxygen to the working muscles (Eliason et al., 2013a). Indeed, Chilko sockeye salmon hearts have an enhanced ability to use adrenaline, which increases cardiac capacity and protection and likely confers a higher thermal tolerance compared to other populations (Eliason et al., 2011). We’re currently trying to understand what other cellular and molecular mechanisms are important for maintaining cardiac function at high temperature. We’re also interested in the broader implications of these climate-driven ecological changes on the population and community dynamics. Pacific salmon are keystone species in the Pacific Northwest. How do fluctuations in their abundance or migration timing impact the larger community? Pacific salmon are not just ecologically, but also economically and culturally important fish species. What are the economic, social and cultural implications for humans? Almost all of our work thus far has focused on how ecology is shaping evolution in salmon, but it’s very interesting to also consider how evolutionary change might influence ecology in this system. If Chilko sockeye salmon are so great, why don’t we just spread their genes all over the Fraser River watershed to save the salmon? This question gets me riled up every time. The research outlined above is focused on a single, brief time period in the life cycle of salmon. The upriver migration only lasts ~4 weeks and thus represents ~2% of the lifespan of a sockeye salmon. The other 98% of the time is spent on spawning grounds, incubating as eggs, rearing in their natal lake as fry, migrating downstream to the ocean as smolts, and feeding and growing in the ocean for a couple of years as sub-adults and adults. The environmental conditions and selection pressures vary widely across the life cycle and among habitats. It would be foolish to assume that traits are fixed across all life stages (i.e. no phenotypic plasticity), or that traits beneficial for one environment are advantageous in all environments. In fact, Chilko sockeye salmon eggs incubate in a cool alpine lake or stream, and studies have shown that Chilko eggs have a correspondingly lower thermal tolerance compared to populations that incubate at warmer temperatures (Whitney et al., 2013, 2014). Given the broad environmental heterogeneity across salmonid habitats, and the uncertain future with respect to ongoing climate change, we should be focusing on preserving biodiversity and maintaining sufficient genetic and phenotypic variability within the species. Will Fraser River sockeye salmon adapt fast enough to keep pace with climate change? The short answer? I don’t know. The long answer? 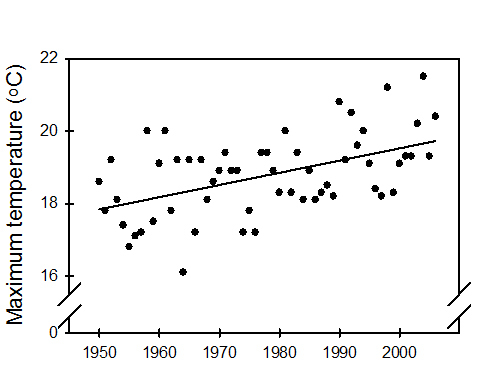 Fraser River temperatures have increased by ~2°C over the last 60 years (Patterson et al., 2007), and are expected to continue to increase along the same trajectory. In order to cope with warming river temperatures, salmon will need to undergo some combination of behavioural and physiological adaptation. Fig 4: Yearly maximum Summer Fraser River Temperatures. Data from Patterson et al., 2007. Behaviourally, salmon can avoid the warm water temperatures by entering the river when temperatures are cooler (Reed et al., 2011) or by hiding out in deep, cold lakes until conditions become more favourable. However, energetic and timing constraints can limit these strategies. High Fraser River flows during the freshet in the spring prohibit passage, and many sockeye salmon spawning grounds freeze over in the fall and winter. 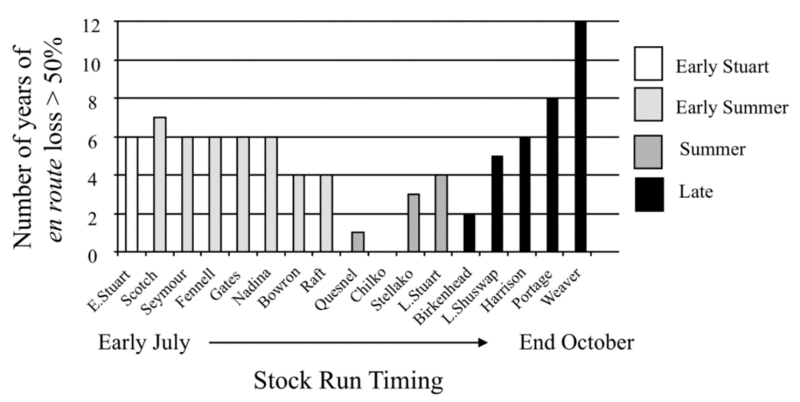 In addition, spawning dates are highly conserved within a population to match incubation and emergence timing with optimal conditions for fry. The other option is to increase their physiological thermal tolerance, by improving cardiorespiratory performance at high temperature for example. Some salmonid populations do have the capacity to cope with warm temperatures – redband trout in Oregon can encounter summer river temperatures between 24 and 30°C (Rodnick et al., 2004). Hatchery-reared rainbow trout in southern Western Australia have undergone passive selection over 19 generations to increase thermal tolerance (Chen et al., 2015). Studies have shown that rapid evolution can occur in salmon populations over just 11–30 generations (Hendry et al., 2000; Quinn and Adams, 1996; Quinn et al., 2000). However, 11–30 generations is a fairly long time, since Fraser River sockeye salmon typically have a 4 year life cycle; we’re talking about 44–120 years. All told, salmon are remarkably resilient. So it’s not all doom and gloom, and I wouldn’t count Fraser River sockeye salmon out just yet. Chen, Z., Snow, M., Lawrence, C.S., Church, A.R., Narum, S.R., Devlin, R.H., Farrell, A.P., 2015. Selection for upper thermal tolerance in rainbow trout (Oncorhynchus mykiss Walbaum). The Journal of Experimental Biology 218, 803-812. Crossin, G.T., Hinch, S.G., Farrell, A.P., Higgs, D.A., Lotto, A.G., Oakes, J.D., Healey, M.C., 2004. Energetics and morphology of sockeye salmon: effects of upriver migratory distance and elevation. Journal of Fish Biology 65, 788-810. Eliason, E.J., Clark, T.D., Hague, M.J., Hanson, L.M., Gallagher, Z.S., Jeffries, K.M., Gale, M.K., Patterson, D.A., Hinch, S.G., Farrell, A.P., 2011. Differences in thermal tolerance among sockeye salmon populations. Science 332, 109-112. Eliason, E.J., Clark, T.D., Hinch, S.G., Farrell, A.P., 2013a. Cardiorespiratory collapse at high temperature in swimming adult sockeye salmon. Conservation Physiology 1, 10.1093/conphys/cot1008. Eliason, E.J., Wilson, S.M., Farrell, A.P., Cooke, S.J., Hinch, S.G., 2013b. Low cardiac and aerobic scope in a coastal population of sockeye salmon Oncorhynchus nerka with a short upriver migration. Journal of Fish Biology 82, 2104-2112. Farrell, A.P., Eliason, E.J., Sandblom, E., Clark, T.D., 2009. Fish cardiorespiratory physiology in an era of climate change. Canadian Journal of Zoology 87, 835-851. Fraser, D., Weir, L., Bernatchez, L., Hansen, M., Taylor, E., 2011. Extent and scale of local adaptation in salmonid fishes: review and meta-analysis. Heredity 106, 404-420. Hendry, A.P., Wenburg, J.K., Bentzen, P., Volk, E.C., Quinn, T.P., 2000. Rapid evolution of reproductive isolation in the wild: Evidence from introduced salmon. Science 290, 516-518. Patterson, D.A., Macdonald, J.S., Skibo, K.M., Barnes, D.P., Guthrie, I., Hills, J., 2007. Reconstructing the summer thermal history for the lower Fraser River, 1941 to 2006, and implications for adult sockeye salmon (Oncorhynchus nerka) spawning migration. Canadian Technical Report of Fisheries and Aquatic Sciences 2724, 1-43. Quinn, T.P., Adams, D.J., 1996. Environmental changes affecting the migratory timing of American shad and sockeye salmon. Ecology 77, 1151-1162. Quinn, T.P., Unwin, M.J., Kinnison, M.T., 2000. Evolution of temporal isolation in the wild: Genetic divergence in timing of migration and breeding by introduced Chinook salmon populations. Evolution 54, 1372-1385. Reed, T.E., Schindler, D.E., Hague, M.J., Patterson, D.A., Meir, E., Waples, R.S., Hinch, S.G., 2011. Time to evolve? Potential evolutionary responses of Fraser River sockeye salmon to climate change and effects on persistence. PLoS ONE 6, e20380. Rodnick, K.J., Gamperl, A.K., Lizars, K.R., Bennett, M.T., Rausch, R.N., Keeley, E.R., 2004. Thermal tolerance and metabolic physiology among redband trout populations in south-eastern Oregon. Journal of Fish Biology 64, 310-335. Taylor, E.B., 1991. A review of local adaptation in Salmonidae, with particular reference to Pacific and Atlantic salmon. Aquaculture 98, 185-207. Whitney, C.K., Hinch, S.G., Patterson, D.A., 2013. Provenance matters: thermal reaction norms for embryo survival among sockeye salmon Oncorhynchus nerka populations. Journal of Fish Biology 82, 1159-1176. Whitney, C.K., Hinch, S.G., Patterson, D.A., 2014. Population origin and water temperature affect development timing in embryonic sockeye salmon. Transactions of the American Fisheries Society 143, 1316-1329. High enthusiasm and low r-squared. How to be a Postdoc.